We all know next week we’ll be eating leftovers for days. All the turkey. Finishing the jars of cranberry sauce. The extra veg. But we don’t want to be eating turkey & stuffing sandwiches/baps all week. Or just cold meats and crackers. It all gets a bit dull. And that is NOT what Christmas is for! 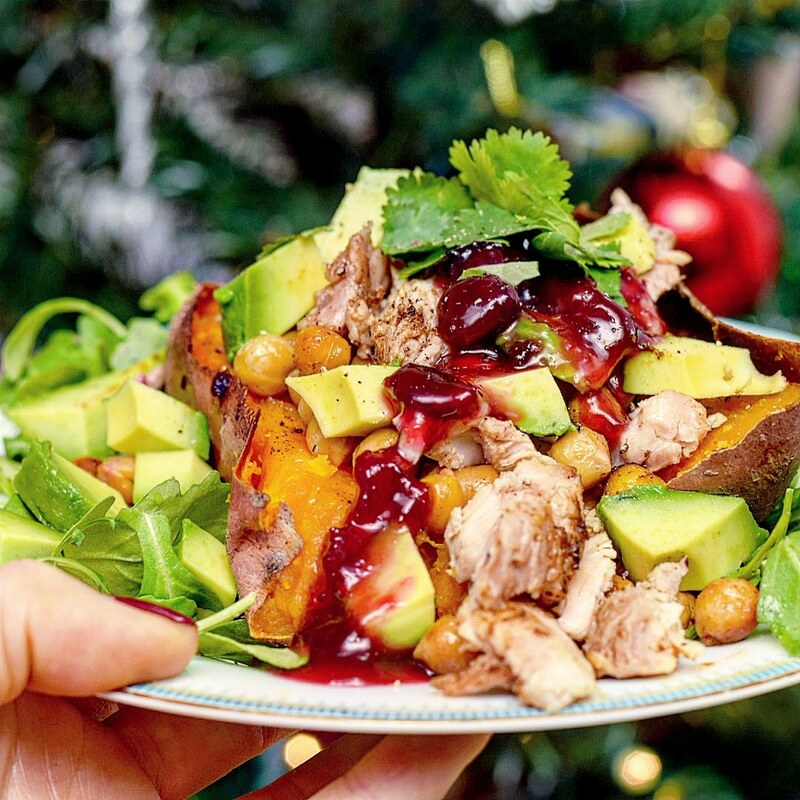 Christmas is for all the delicious food, including healthy options and delicious twists to use up those leftovers. Let’s avoid food waste, get creative and really enjoy the one time of year we eat masses of turkey and cranberry. It doesn’t have to be bland or boring. I like to re-season my meat with a few spices before re-heating. Adding some chickpeas/beans whilst heating, I then serve atop a jacket sweet potato with fresh avocado and rocket – I’m sure we’re all craving fresh greens by the 27th! I also add a spoonful of cranberry sauce, and it’s super delicious! The sweetness and spices complimenting one another really well. 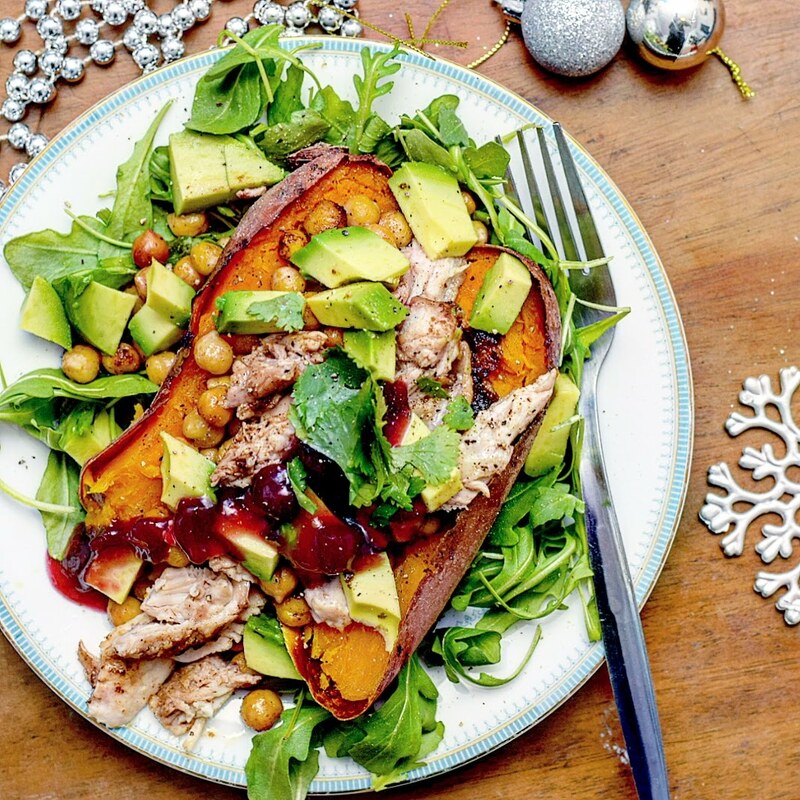 A jacket sweet potato piled high with all of this makes a fab dinner in the days after Christmas. You could even add some re-fried shredded sprouts! Full recipe is below. Hope you enjoy. How do you use up your leftovers? A delicious way to use up those Christmas lunch leftovers. Pre-heat the oven to 220° celsius. Pop the sweet potatoes in the centre of the oven for 45 minutes. After 20 minutes (the sweet potatoes still have 25m to go), place the chickpeas on a sheet of foil. Sprinkle over the paprika, cumin and all-purpose seasoning, Wrap the foil around the chickpeas, and bake in the oven for 10 minutes. Remove the parcel of chickpeas from the oven, shred and add the turkey, re-cover/wrap and pop back in the oven for 15 minutes. Divide the rocket between two plates. Slice the avocado into small cubes and pop to the side. Slice the baked sweet potatoes in half, pop on top of the beds of rocket. 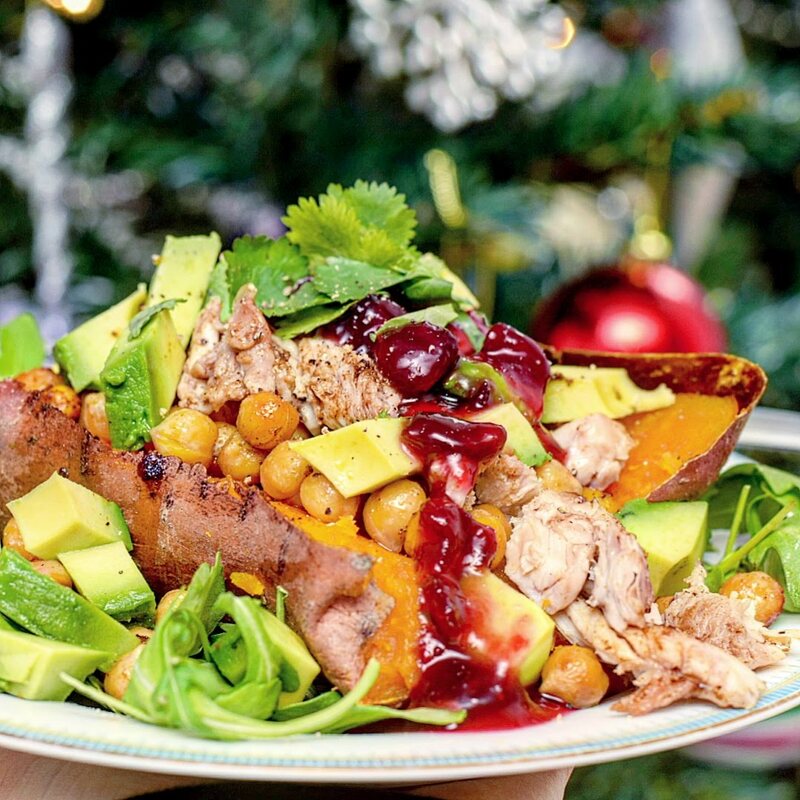 Top with the spiced turkey and chickpeas, add the avocado and a tsp of cranberry sauce to each. Season to taste with salt and pepper, and a little chopped coriander. Enjoy! This is such a healthy twist on the classic leftovers. I like to make quesedillas with turkey, cranberry sauce and brie, so good!